The photograph above shows rectangular expansion joints being prepared for shipment to Russia. 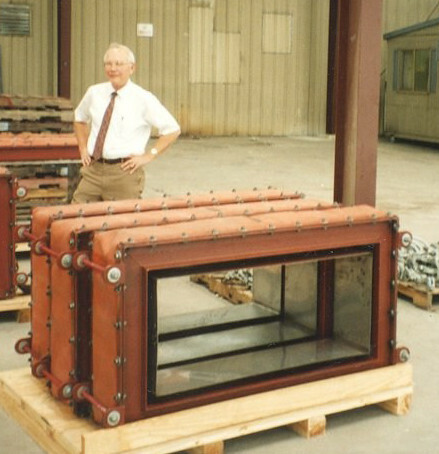 These were fabricated to replace units in a methanol plant duct system. The fabric belt is constructed of layers of material selected to handle the hot gases at low pressures. The frames can be fabricated from a variety of metals in a variety of shapes depending on the particular application. 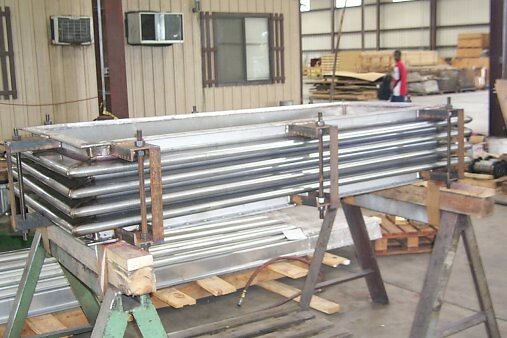 U.S. Bellows, Inc. manufactures a stainless steel rectangular expansion joint, 28” x 66”, for an exhaust system at a chemical plant in South Carolina. This joint is equipped with a liner, tie rods system and mitered corner bellows design. The expansion joint was designed for 15 psig at 600 °F and leak tested. A 100% dye-penetrant test was also performed on all the welds.